What to know about solar in Strata? Are you prepared for the next wave of holidays to hit? The Easter holidays are almost upon us – finally! 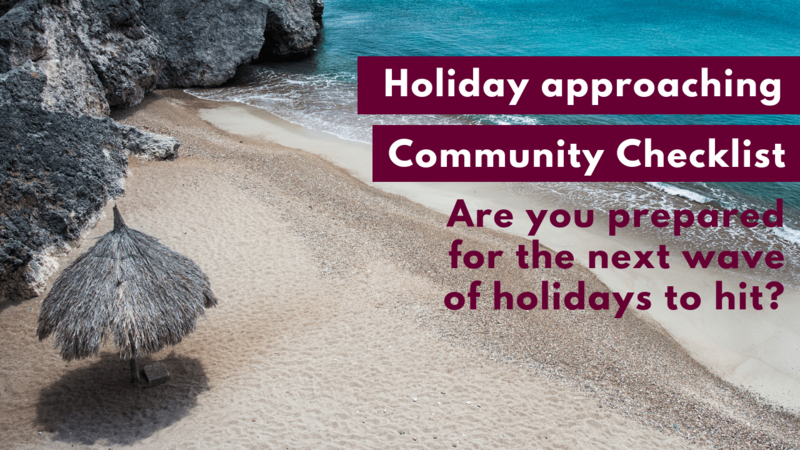 Whilst we’re all looking forward to the rest and relaxation of holiday-time, it’s important your strata community is prepapred for the unique challenges that holidays can present. For many communities, it represents a big break in the norm for how their community is used and so we’ve put together a checklist for you to tick off as Easter nears. This checklist dives into the short stays that might complicate everyday living, the security implications of vacant lots and full mailboxes alongside the likelihood of parties and extra noise that holidays bring to the table. Airbnb and short stays aren’t a ‘trendy’ option anymore, they are the option for over 5 million Australians/visitors to our country per year. Once a rarity, at Ace we’ve become accustomed to the popularity and widespread use of short stay providers like Airbnb, Stayz and others over the last few years. 1. Is hosting permitted in your community? It’s not hard to make a few extra bucks renting out a spare room or the entire apartment during a peak holiday time, but doing so without community approval or in spite of by-laws prohibiting it could be cause for major disputes. The first box to tick, is absolutely to establish whether your community permits short stays. 2. Do guests receive copy of by-laws? We know guests get a key, or code when they check in, but do they get a copy of your by-laws? You can’t expect short stay guests to guess what the right behavior is regarding pool times, smoking, pets and more so be sure to clearly present them with by-laws on arrival or in the property so that they can be 100% aware of how to behave in an unfamiliar community. 3. Is the right security in place to track visitors? Through its very nature of allowing strangers to stay in your community, short stays can present some security risks. So we’re encouraging you to think about whether your community security is set up to manage those risks. Are keys left in lockboxes within plain sight of the street? Are swipe card entry cards being returned at the end of each stay? Have a think about how you can mitigate these risks before they may impact you. Empty apartments, full mailboxes and unattended vehicles in car parks can be a major target for thieves during the holiday period – but it doesn’t have to be that way. Some simple checklist items can help reduce the risk of your community being exposed to some of things we see too often at Ace. 1. Are holidaying neighbours diverting/organizing collection of their mail? It may sound trivial, but mail theft is the major opportunity out there for identity thieves. In recent years, we have observed countless incidents of Australian communities being the target of organized crime targeting overflowing mailboxes at Christmas, Easter and school holiday times. So double check that your community members have a plan for their mail if holidaying this Easter. 2. Are balcony doors locked? Last year, Queensland Police reported they had their own ‘Spiderman’ thief on their hands, targeting vacant apartments with unlocked balcony doors. Where there’s a will there’s a way! So, be sure to remind any holidaying community members that it’s not the front door that needs to be locked. Access to one lot can often mean access to many so its in your entire community’s best interest. People like to have a good time over the Easter break, but that shouldn’t mean it disrupts the rest and relaxation of others. Issuing reminders about noise curfews and party policies will be a good way to ensure that you don’t get any unwanted disruptions this Easter. Family visiting these holidays? Visitor parking has long been a breeding ground for community disputes so we’re urging you to ensure residents and their guests clearly understand where they should be parking.